Our research shows operators in the US, China, Korea and Japan chase 5G most enthusiastically and back that enthusiasm with real investment. Operators in Europe, such as Orange, Telefonica, Veon, Telkom, BT, Telenor and Vodafone haven’t held back from taking part in the 5G jamboree but have been more muted in their approach. Most importantly, they continue to invest heavily in their LTE networks (for example in LTE-A Pro) in their pursuit of a “glide path” to 5G. Operators in SE Asia, South Asia, MENA and Europe are (privately) cautious about the prospects for rapid roll-out of broad coverage. 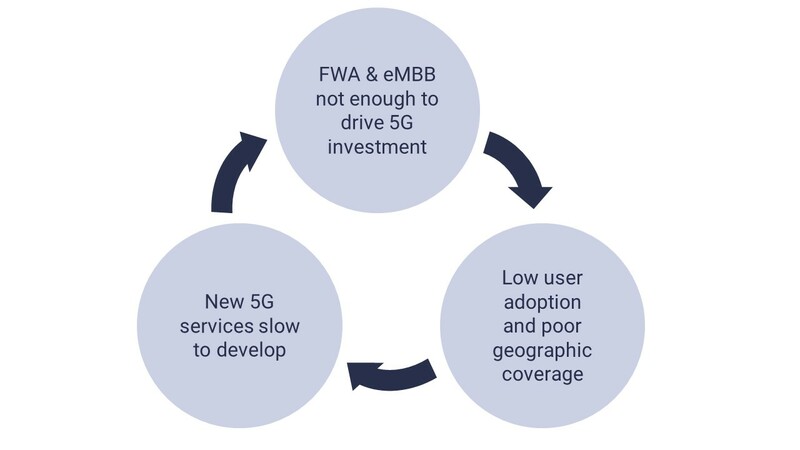 They think 5G offers compelling cost advantages over LTE for eMBB in denser urban locations and potentially FWA in certain suburban ones (where fibre has not been widely adopted). We set this out in our recent report: 5G: ‘Just another G’ – yet a catalyst of change. This creates a predicament over how to expand beyond these 5G islands. Without wider coverage, how can operators catalyse ecosystems to invest in new services (low-latency, immersive or Massive MIMO)? Somewhat counter-intuitively, 4G and edge compute can help to accelerate 5G coverage and device adoption rather than delay it. Astute operators can mix commercialised edge compute and 4G to create “good enough” capabilities for 5G services to fall back onto. And these will overcome limitations in 5G geographic or device coverage. While 4G + edge compute won’t be as high performance or cost efficient as 5G, they will be good enough to provide the basis for securing greater demand for services. A gaming company that wants to create a distinct gamer experience needs high-end GPUs mainly found in 5G phones. The company may find its addressable market is limited because there are few existing devices. By using edge compute, it could address a broader base of 4G devices, at least initially, and succeed ahead of wider device adoption. A maintenance company wants to introduce lightweight AR headsets to its teams in the field. The company needs to be sure that these could be used acceptably outside 5G coverage areas. The “5G” experience might be enough to convince the company of AR’s potential, but scaled adoption will require coverage. And there are other ways to spur development of new services and associated ecosystems that will drive demand in 5G services. Adapted from an article on LinkedIn by Phil Laidler, Consulting Director. You can follow our LinkedIn page for news and information.